We are lucky enough to have a garden with good shrubs and a Tulip tree that we inherited. 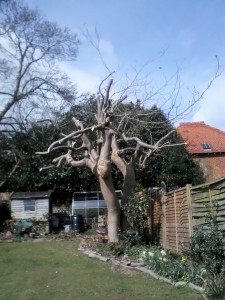 Although the tree is pretty with very unusual blooms, it is actually too big for our garden. However in the summer we place our garden bench in its lovely dappled shade. Having asked Chris and his team to prune it for us recently, not only did he give the tree a good ‘hair cut’, but I asked if we could use the branches to edge the lawn with when he had finished. So he cut them into small sections and put them into place. The result is a very effective ‘natural’ edging, which also meant that we didn’t need to get rid of the prunings. All in all a good job!